Best known for his surreal verbal sallies on the BBC’s topical news quiz Have I Got News For You, Merton might seem an unlikely silent film enthusiast. But the 50-year-old can still recall seeing Buster Keaton’s The General aged 13 in the Academy Cinema in London’s Oxford Street with live musical accompaniment and a burgeoning sense of wonder. 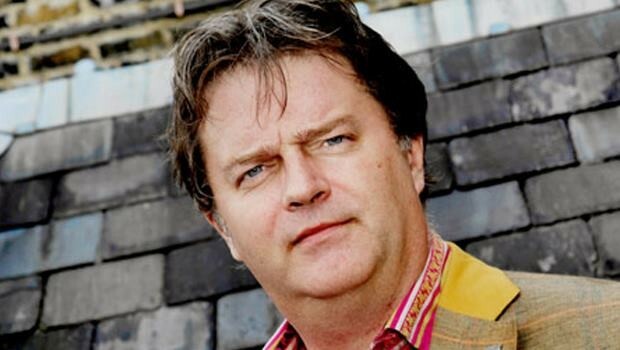 Filming his travel documentary Paul Merton in China recently, he found himself visually composing a sequence in the style of Keaton, whose “Great Stone Face” is echoed in his own distinctive, deadpan delivery. Sitting in his agent’s office, I can hear Merton’s familiar chuckle several minutes before I meet this famous student of classic comedy. In his teens, he purchased a super 8 projector to bring the films of Keaton, Charlie Chaplin, Harold Lloyd and Laurel and Hardy to life on his bedroom wall. Yet in 2006, this hobby spawned a series of BBC Four documentaries, Paul Merton’s Silent Clowns, featuring clips of the silent era legends and a stage show that featured pianist Neil Brand. Pleasantly surprised by the reception these performances attracted, the pair are touring the UK once more in a show that features Brand accompanying a full-length screening of Safety Last!, the landmark film in which Lloyd famously hangs from the clock face of Los Angeles’ Bolton Building. “When we showed Safety Last! in Bristol, I was approached by a couple of kids afterwards,” says Merton. “They pointed out that the difference between the new King Kong movie and Harold Lloyd was that you know it’s actually him hanging there. When you’re watching Kong, you’re well aware he’s a computer generated image and your brain never allows you to forget. These are just two of the iconic scenes Merton explores in his new book, Silent Comedy, a unabashed labour of love chronicling the artistic achievements of a fleeting, 30-year period that established the most popular comedians the world will ever know, even as he concedes that many of their works simply involved “people being kicked up the arse”. “A lot of those early films aren’t very good because they were made quickly and weren’t designed to last more than a week,” he explains. “As long as you got the film out there it didn’t matter because people were hooked on going to the cinema. Film fans of the 1910s were going three or four times a week. But all you’d see is the Keystone Cops continually falling over. It’s not particularly amusing now and I suspect it never was. The quality of film stock, establishing of correct screen ratios and sympathetic musical accompaniment are integral to the laughter in these films. Merton can relate with horror the experience of watching Chaplin’s Easy Street with a drum ‘n’ bass score. The most compelling aspect of Merton’s book is his tracing of the silent clowns’ creative rivalries and the referencing of each other’s pioneering scenes in their films; how they dramatised their own thinly disguised biographies; how the likes of Keaton and Chaplin rallied around their friend and contemporary star Roscoe ‘Fatty’ Arbuckle when he was accused of murder; and how, in one peculiar instance when Lloyd lost a thumb and forefinger lighting a cigarette from a bomb, Keaton appeared to re-enact it as a gag. “I’ve never read of this approach to silent comedy before,” Merton claims. “If someone’s writing a book about Keaton, generally it’s all about Buster. Chaplin doesn’t come into it. I always felt that this was wrong because Hollywood was such a small place back then, they all knew each other and they’d be round each others’ houses playing snooker and having parties. “All that stuff about who was the better director out of Chaplin and Keaton, I wanted to reject that. They were inspiring each other. When Chaplin made The Kid it raised the bar of what a comedy feature film could be. Paul Merton’s Silent Comedy is in bookstores now. His Silent Clowns tour with pianist Neil Brand commences on November 10 and runs through to December 9. A version of this article originally appeared in the Herald on October 27, 2007.